Saudi Arabia announced a limited amnesty Wednesday for Muslim militants who surrender in the next month, saying they will not face the death penalty and will only be prosecuted if they committed acts that hurt others. Crown Prince Abdullah read the brief announcement on behalf of his half-brother, King Fahd, on state television Wednesday. He said the offer was open to anyone who has not yet been "arrested for carrying out terrorist acts." "We are opening the door of amnesty … to everyone who deviated from the path of right and committed a crime in the name of religion, which is in fact a corruption on earth," he said. "We swear by God that nothing will prevent us from striking with our full might" anyone who ignores the offer, Abullah said. Saudi Arabia has seen a string of fatal attacks blamed on al Qaeda and sympathizers of the anti-Western terror network. Some of the attacks targeting foreigners have been unusually brazen and gruesome. The most recent of the attacks was the June 12 kidnapping of American engineer Paul M. Johnson, Jr., whose beheading was announced six days later on the Internet. The Saudi Qaeda cell said Monday that sympathizers in the Saudi security forces helped to kidnap Johnson, who was threatened with death unless authorities released all Qaeda prisoners. The Saudis refused to negotiate, and Johnson was beheaded. Saudi officials denied any complicity by security officers. The apparent leader of al Qaeda in Saudi Arabia, Abdulaziz al-Morqin was killed in a shootout with Saudi forces Friday after his cell announced it had killed Johnson. Saleh Mohammed al-Aoofi, the man most likely to take over leadership of al Qaeda in Saudi Arabia, reportedly trained with the Saudi military and worked as a prison guard before joining Muslim militants in Afghanistan. 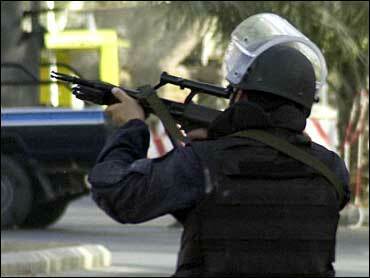 But the crackdown has not altered a State Department warning that Americans defer travel to the kingdom. In a briefing Monday, State Department spokesman Richard Boucher said the reason the U.S. tells Americans not to travel to Saudi Arabia and to consider leaving if they are already there is "based on the fact that the Saudi authorities, as commendable as their overall effort is, have not yet been able to crack the — to stop the terrorists to the point that everybody doesn't have to worry anymore." The crackdown followed sharp criticism of Saudi Arabia by some U.S. officials after the Sept. 11 attacks, who saw Saudi financing supporting terrorism. The staff of the Sept. 11 commission last week said in a report that no official Saudi financing was behind the attack, but Saudi charities might have helped to finance al Qaeda. The Saudi government has imposed tighter regulations on charities.